You do have options–lots of them in fact. Shop around. 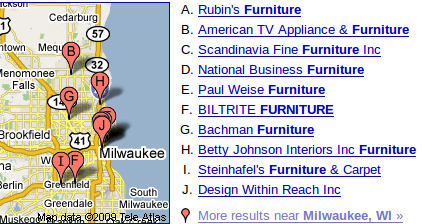 There are plenty of places in the Milwaukee area that sell bedroom, living room, dining room, home office, appliances, and electronics merchandise. Consider going to any one of them instead of patronizing Colder’s. This list is far from complete, in fact; do your own online search–for furniture in the case of the graphic above–and you’ll find plenty of alternatives to Colder’s that may provide a much better shopping experience before, during, and after the sale. The quality of the merchandise at these alternative businesses is generally the same (lots of it imported from China), or better. Don’t get sucked in by Colder’s Half-Back, Full-Back, “Something More”, “Spend a Dollar, Get a Dollar” ads on TV and elsewhere, either, unless you really shop around and know what you’re doing. It may or may not be a better deal in the end. Many of these other stores will have better everyday pricing than Colder’s. You might even avoid being stalked throughout the store like a piece of meat, too. We are NOT endorsing any of the stores listed in the graphic above. Any of them–all of them–could potentially rip you off or cause you grief in some fashion, maybe in the same or a similar way Colder’s is ripping off us and others. You may notice that Colder’s isn’t even listed in the short results; they don’t show up in the extended results until several pages later. From our perspective at this point, the farther down the list, the better.